The dark narrow alleys gave in to a wider street. She stopped for a while with hands on her knees. Half bent she let out a sigh. The worse was finally over. She rumbled through her coat, not to take any chance. One could never be sure until ..yes the pack was well concealed in the hidden pocket of her bra. She darted a quick glance around, surprisingly her chasers had lost the plot. A smile played on her lips, she has been successful in getting her way out, unscathed. For what she carried with her was well worth killing for! The barren street lay ahead of her in its nightly glory. The street lights as if covered the sleepy buildings in an amber blanket. She straightened up, wiping off the sweat from her forehead and pulling the stray strands of her unkempt hair back. With her hands folded tightly to her chest she strutted forward in that all familiar cobbled street. It was this very place she had met him how many nights back she could hardly remember. Was it a week, month or a year; or is it more than that? It hardly mattered now. It hardly mattered now what a meaning-less life she had been living before she met him. It was as if she rediscovered life with him, he showed her the greatest highs of life. He gave a purpose to her aimless life. She couldn’t have asked for more. It was as if she had been searching for him all along, without realising it ever. All she remembered was the cold winter night and his first magical touch. From a total stranger, how he became her saving grace, she didn’t know,she never pondered. For she had found true bliss. Nothing else mattered. 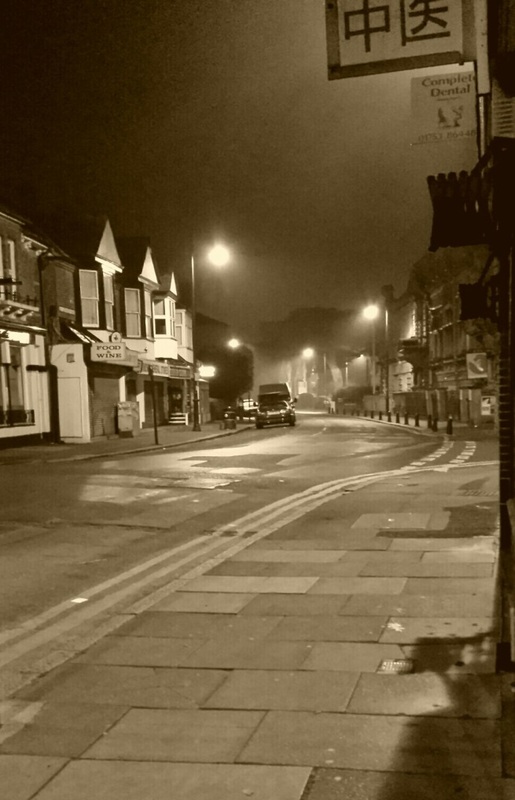 With each step she sniffed the crisp air in, the faint aroma of the Chinese takeaways still lingered around. She must hurry. He twitched his eyebrows. Something was itching in his hazy blue eyes. The eyes that had seen life yet had always tried to run away from it. Life never gives back you chances no matter how much the inspirational books rant about it. No matter how much people boast of a second chance and how their lives transformed for the better, he had come to face the fact that, his world, too like many others, was near perfect. For he had found that eternal peace, a joy so limitless, it could well be divine. The body seeks pleasures the mind doesn’t care about. He had chosen to find the joys the mind can bring. He had chosen to stimulate the mind. He had nothing to lose. He had been living in a dream, day after day, night after night. His life had been a calming sea of joy, peace and a divine ecstasy, with intermittent intervals of worldly pain. He wanted to share his life, his joys. Not many liked him, but the very few who did, treaded the same path, lived the same life. Tonight he may find just another one of his kind, or transform a life, as he said was an apt way to describe it. He could see from a distance the lonely shadow approaching. Just about time. “I know why you come out every night” his hushed voice. “Sorry, do I know you?” A sense of surprise in her eyes. “I know you, I see the pain in your eyes, and I can feel what you are going through. Just listen to me. Life is never fair, but we can make it..” He stopped. He took out his hand from the worn overcoat and extended towards her. His lean hairy wrist and the white fingers dazzled in the street light above. Even before she could react, he pulled her arms and shook her hands. “Trust me, your life will be transformed.” He turned away from her and limped across the street to a dark nowhere. There, in her open palm lied a small translucent plastic pouch with what looked like tiny little pearls, shining away. She opened it gently, knowing what was she making herself into, and held it out in her palms, thinking. The worse was over. May be this is what she was lacking. Out from home, beaten by the rogue she called her boyfriend and an abortion later, there was not much pain left in the world that could deter her. She needed some rest, she needed some well-deserved happiness. And there it lay in her palm. She smiled and took one of those white pearls on to her lips. Then she took another one, and then another. And she had discovered what was missing in her life, for all those sixteen years. A gateway to end all her pain..
She checked the pack again, walking as fast as she could, past the food joints and the saloons. The wallet she had nicked off from a man in the high-street earlier in the evening, it had some cash. She was smiling now. It should be enough to buy her some..err pure bliss and ecstasy. The old man in a worn out overcoat waited at the end of the cobbled street, waiting for whom he didn’t know. All he knew was he had transformed lives, and there’s a price one must pay for it. She started sprinting towards the end of the street,before its too late. The worse will be soon over.